Sarah Silverman is a popular American standup comedian, writer, and actress. Her attributes as a comedian includes her unique way of making out the best jokes from controversial topics like religion, sexism and politics. She has also made waves as a producer and writer. Sarah is unique in all things, she sees the world from a different perspective and has used that basis to drive her career to a enviable heights. Here is everything there is to know about her. The comedian was born in Bedford, New Hampshire on the first day of the month of Christmas (December) precisely in the year 1970, she also bears the name Kate. She is an American who was born and raised by Jewish parents of Ashkenazi Jewish descent, Beth Ann O’Hara (mother) and Donald Silverman (mother). Beth worked as a campaign photographer while Donald worked as a social worker and also had a clothing store. The comic actress grew up in Manchester, New Hampshire. She is one of five siblings and the youngest of them all. She has two sisters; Reform Rabbi Susan Silverman and Laura Silverman; the famous actress, and two brothers; Rabbi Susan- a screenwriter and Jeffrey Michael, who died when he was a toddler. Despite being born into a Jewish home, Sarah prefers to address herself to being a secular and non-religious person. The comic actress graduated from Derryfield School in Manchester in 1989 and later spent a year at New York University. Sarah Silverman started her career as a teen, she made her first audience in Boston when she was just 17. Subsequently, she put up shows at local clubs and gave them her best shot. As time rolled by, she endeared herself to the hearts of many with her great sense of humor. Come 1993, she joined the NBC team as a performer and writer for the show, Saturday Night Live. Unfortunately, her stay on the show wasn’t or long, she was laid off because her jokes were unaccepted and criticized. That incident roused the beast in her as she decided to work harder. After so much hard work, Sarah Silverman got an offer from HBO to play a role in their comedy-drama, Mr. Show with Bob and David. Her performance on the show got her another slot to perform in the standup comedy show Late Show with David Letterman. That same period, she led a role in the movie, Who’s Caboose? (1997). That announced her to the acting world and she consequently got other roles in movies like Bulworth and There’s Something About Mary (1998), Say It Isn’t So (2001), School of Rock (2003), to mention a few. Sarah Silverman later featured on the Late Night with Conan O’Brien and also played a role in the short-lived sitcom Greg and Bunny (2002). In 2003, she decided to run her own show titled Jesus is Magic while she also played as a television host. Four years later, the comic actress became more prominent after she launched her self-titled show; The Sarah Silverman Program. Unfortunately, the show was scrapped off by Comedy Central after three seasons of the program. It later made a come back in 2013 with a different name as Sarah Silverman: We Are Miracles, this time on HBO. Ever since that comeback, the comic actress has gotten both big and small roles in different comedy movies. The comic actress has strived hard for every penny she has earned. Evidently, Sarah Silverman has also had her shortcomings but she has never let it deter her career growth. She has sure made a fortune for herself working round the clock. Sarah Silverman is estimated to be worth $12 million. Kate (Sarah Silverman) is one lady who shares a different perspective on marriage, commitment and love. On countless occasions, she has aired her views on her beliefs on marriage. She once said she has no plans of settling down or having her biological children but would rather adopt a child than go through the stress of having one. Some sources have linked her perception to her fear of transferring depression to her unborn kids and also her bed wetting weakness. She struggled with bedwetting right from her childhood into adulthood. However, all these reasons have not kept her from having a relationship, in fact, she has dated a long list of men in the past especially celebrities like Louis C.K., Kevin Brennan, Garry Shandling, Sam Seder, Colin Quinn, David Cross, Sam Seder, Kyle Dunnigan, Alec Sulkin, Tom Gianas and more. 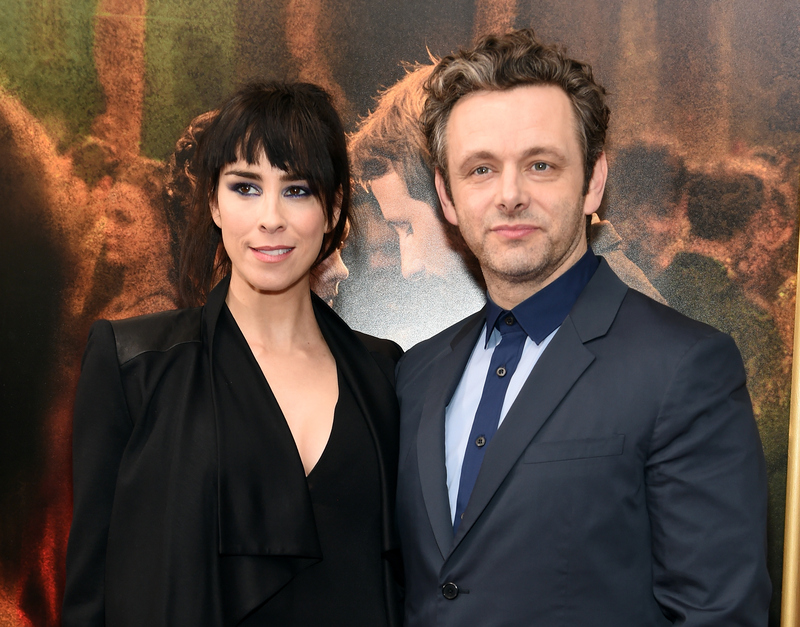 After she walked out on her last boyfriend, Michael Sheen, Sarah Silverman has remained single. Sarah Silverman suffers from clinical depression and is addicted to Xanax. She currently takes the drug Zoloft in order to help her emotional state. She previously suffered from epiglottitis which is a life threatening condition that occurs when the tissue protecting the windpipe gets inflammed. Sources say that she hasn’t won over her bedwetting issues. She is still struggling to walk past that part of her life. The comic actress stands at 5 feet 7 inches and weighs 57kg. She measures 36-26-37 inches for her bust, waist and hip sizes respectively. She possesses a cute set of brown eyes and wears black hair.